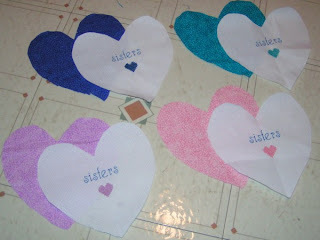 Two years ago today, I sent out my first "Sisters of the Heart" email. Two days earlier, I'd emailed my closest friends - Miriam, Jennifer, and Gabrielle, and asked if they'd like to form an email accountability group. Though we would have loved to meet together on a regular basis, email was the way it had to be. You see, though Miriam and I lived only 45 minutes apart, the others were states away, one in Nebraska, the other in Idaho. Ironically, all of our friendships grew via email. Though Miriam and I had known each other since we were 4 - in fact, her family helped move my family in when we moved to Alabama - we never were extremely close until we started emailing each other frequently when we were 11. Jennifer found me through a comment I made on The Rebelution, went to my old blog, and from there to my personal website (which isn't updated much anymore...), where she figured out that we shared the same exact birthday. Her comment with the subject "It's my Twin!" made me wary at first, but suspicions were soon put to rest when I read what she had to say, and we started emailing. We have so much in common, we've decided that we truly are long-lost twins. :) That was 3 years ago, and we have since met in person 3 times and enjoyed walking through life sharing experiences with each other. Gabrielle sent me an encouraging email around 2 1/2 years ago, after reading Maidens of Worth. Due to a busy few months, we didn't start seriously emailing until 2 months later, when we discovered a kindred spirit in each other. We've also kept up a lengthy snail-mail correspondence, discovering that we both could write long letters! Her stack of letters exceeds the letters from any other penpal. :) We have yet to meet in person, though we have high hopes of all getting together this summer. Though we've never talked face to face, our hearts have truly connected. We still continue our weekly emails (now on week 105! ), sending out our goals and prayers at the beginning of the week, and the follow-up results and praises at the end of the week or beginning of the next. We've also started periodic conference calls through a free service Jen set up. These sisters have given me motivation to get many needed things done, and upheld me in prayer so many time. I am so thankful for the blessing God has given me in them. Though we are similar, sharing similar convictions and interests, we're also quite different. We've been encouraged in our similarities and differences, amazed at the way God works in each person's life. We're not perfect; we struggle in many ways; we often don't meet our goals; I don't always support them as much as I should. But God's grace is there for our every need. And it has been a blessing to know that my sisters of the heart are there as well, only an email, letter, or phone call away. Each of us have gone through tumultuous times, but knowing that our sisters were there, praying, and encouraging, has made them a little easier. Gabrielle, Jen, and Miriam, happy 2-year anniversary of "official" sisterhood! =) I look forward to many more years of sharing together. Anna, I have been so blessed by all of you these past two years. You are right, we have had our "bumps in the road" and we are vastly different (I think that is reserved for me ;-) but we all love each other....and I think accept the ways in which we are different. The "Sisters" has been one of the best things for me. I'm so encouraged by these girls and am thrilled that we're still keeping up our emails. 105 weeks...wow! Happy "birthday" sisters! :) You all are special and these past two years have been a blessing.